Check your location on all of these first. Some locations may not participate, or just do it on a different day. Here is a list of places where kids eat free or next to nothing. If you have somewhere you want to add let me know! Applebees – Kids eat for free on Monday/Tuesday Nights at select restaurants. One free kids meal per adult entree purchase but additional kids are only $1.00. Participation may vary so definitely call ahead. Baja Fresh– Free kids meal on Sunday with an entree and large drink purchase. Bob Evans Restaurants -Free Kid’s Meal with every adult meal purchased after 4:00 pm on Tuesdays. 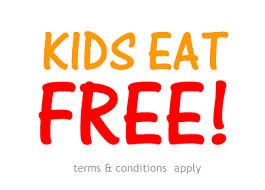 Captain D’s -Kids eat free restaurants offer the deal on Tuesdays and Thursdays. Limited: Two free kid’s meals for each adult dinner purchased. Champps Americana -For every paying adult two children can eat free. Chilis– Monday through Wednesday kids eat free – two kids per adult entree. Chik-fil-A -On Tuesdays when you purchase a combo meal you get a free child’s meal (some areas it is $0.99, not free and some areas it’s on a different day, call to check before you go). Cici’s Pizza – Kids 3 and under eat free 7 days a week. Country Buffet – Kids eat free with purchase of adult buffet. Use the printable coupon on the kids menu. Denny’s – Kids eat free on Tuesdays and (some locations) Saturdays. From 4-10 PM. Famous Dave’s – Kids eat free on Tuesdays (could vary by location). Friendly’s – Kids eat free on Tuesdays. Can vary by location. Firehouse Subs -Kids 12 and under eat free from 4-9pm on Wednesdays and Sundays. One per each adult purchase. Fuddruckers -Not completely free but, 12 and under can eat for .99 from 4-9pm on Mondays and Tuesdays. Locations may vary. Go Roma – Kids eat free on Sundays. Godfather’s Pizza – Kids 10 and under get a free buffet from 11am – 2pm and 5-8pm on Tuesdays. Golden Corral -Kids eat free on Tuesday Nights. Hooters – Kids eat free on Sundays. IHOP – Kids eat free everyday from 4-10pm. Not valid at all locations. Ikea – Kids eat free every Tuesday and during special promotions throughout the year (which they post on their website). Johnny Carrino’s – Kids eat free on Thursdays. Lonestar Steakhouse – Kids 12 and under eat free on Tuesdays – all day. Two children per adult entree. Marie Callender’s– Tuesdays and Saturdays 12 and under with the purchase of an adult entree. Macaroni Grill – Kids get a free drink and ice cream with their meals. O’Charley’s – Kids 12 and under eat free every evening. Note: only some stores are participating, call first before you go. Old Country Buffet -Kids eat free with purchase of adult buffet. On the Border Mexican Grill -Free sundae with kid’s meal purchase. Perkins -Kids eat free at Perkins all day on Tuesday. Pizza Hut– Kids eat free on Tuesday evenings, definitely check your location. Pizza Street -Kids nine and under eat free from the buffet on Tuesday from 5-8pm. Planet Sub – Kids eat free on Tuesdays and Sundays with each adult meal purchased. Ponderosa Steakhouse -Kids eat free from 4:00 to close on Tuesdays. Qdoba Mexican Grill – Kids eat free at Wednesdays (some locations) and Sundays (some locations). Quiznos – All day, every day receive one FREE kids meal with the purchase of an entree (sub, toasty torpedo, regular chopped salad). Participating locations only. Rock Bottom Cafe -Kids 12 and under eat free on Mondays and Tuesdays. Ruby’s Diner -Kids 12 and under eat for free Ruby’s Diner after 4:00 on Tuesday. Ryan’s – Kids eat free with purchase of adult buffet. Shoney’s -Kids four and under eat free everyday with an adult entree purchase. Steak n’ Shake-Kids 12 and under can eat free with a purchase of an adult entree valued at $8 or more only on the weekends. Texas Roadhouse -Mondays or Tuesdays (check your location) kids 12 and under eat free. TGI Friday’s-Kids three and under eat for free on Mondays and Tuesdays. Tony Roma’s -All of Tony Roma’s kids eat free restaurants offer the deal for 12 and under on Tuesdays. UNOs-Kids eat free Tuesdays. One free kids meal per purchase of an adult meal.